Summary: Staithes is one of the North Yorkshire coasts picture postcard villages and this walk complements the village by starting and finishing by the small harbour side. 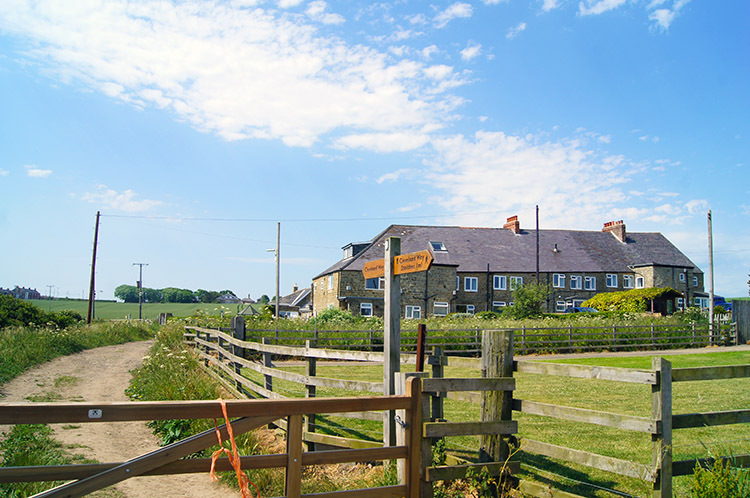 The route leaves the village by following the North Yorkshire coastline south to Port Mulgrave before heading inland to Hinderwell. 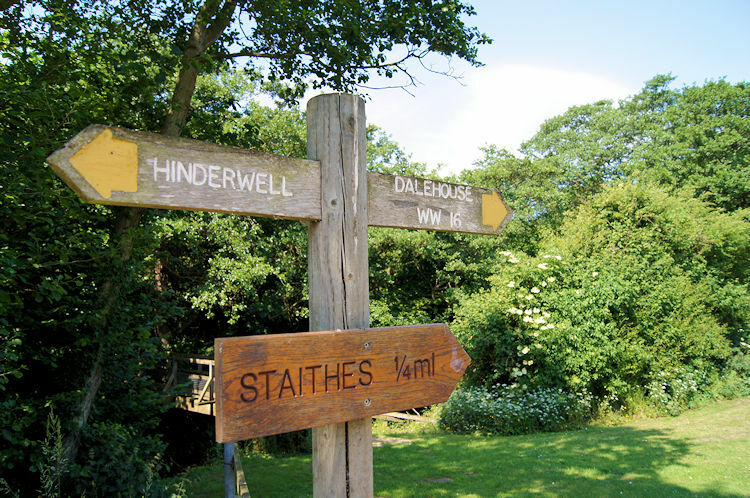 Afterwards there is a lovely woodland path to follow which passes through a nature reserve before returning to Staithes. 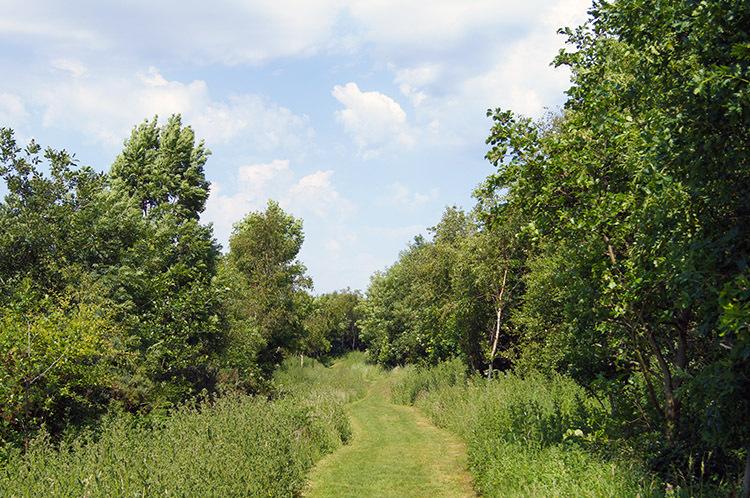 In total the length of this walk makes it ideal to choose for enjoying over a half-day or summer evening. The Walk: It was a gorgeous morning when I opened the curtains. 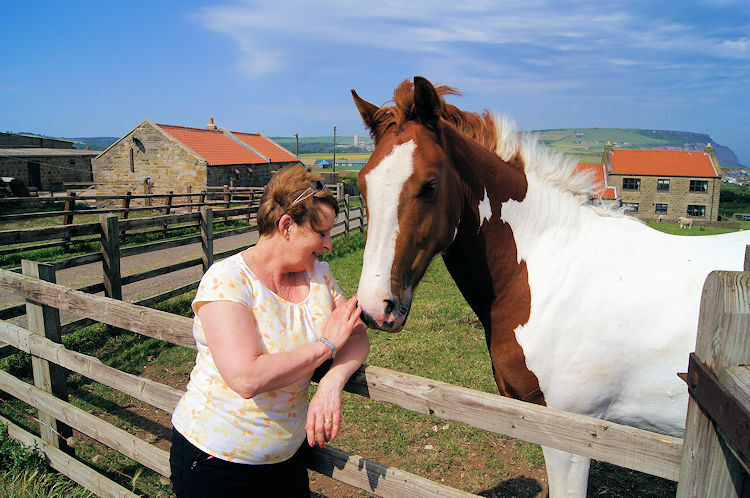 I was home in Harrogate with plans to work in my home office but within five minutes I had changed my mind. Lil was on leave and already bustling about downstairs so after washing and putting on my walking gear I hurried downstairs and said to my wife "Let's go for a walk". She hastily mentioned we had not yet had breakfast and where did I intend to go so I replied "Never mind, it's a surprise and we will get some breakfast on the way. Go and get changed please". Fifteen minutes later we were on our way. To where I had not decided. My first thoughts had been to take a walk in the Howardian Hills but as I drove out of Harrogate I decided on the North Yorkshire coast. We had not been for some time and Lil really likes the seaside so that decision was settled. But where exactly? 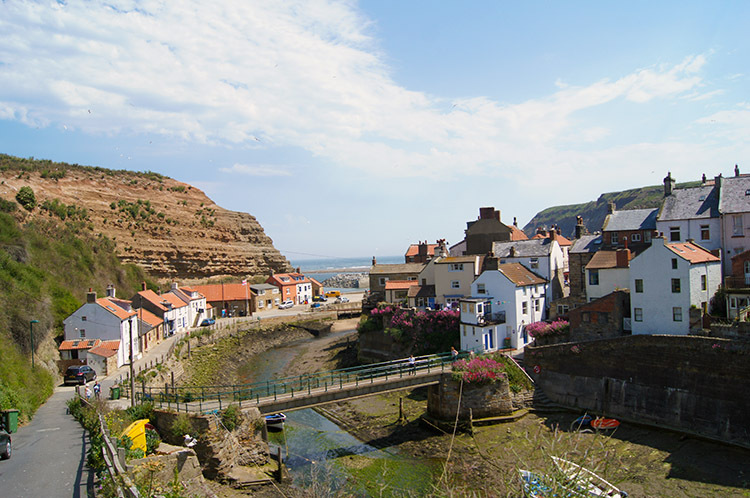 It did not take long for me to choose Staithes as I had an ideal walk in mind which was not too long for Lil to enjoy. Job done though I did not tell Lil where we were heading until she worked it out for herself when the road signs made it quite obvious. And when she had realised where the destination was she was pleased. 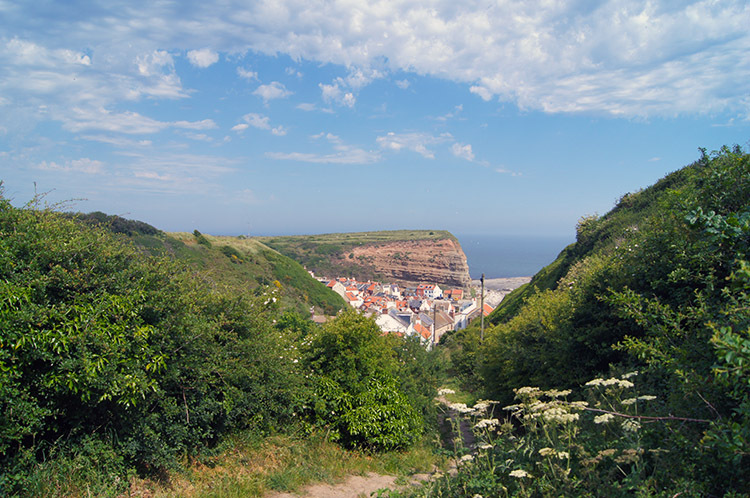 Having parked up in the car park at the top of the village we ambled down Staithes Lane and High Street to the start of the walk proper by the harbour. The amble down took longer than expected as Lil beelined into quite a few shops to browse while I waited impatiently outside them. I wanted to get going but I tempered my impatience better than I usually do. Eventually she was sated of the shops and we got to the harbour and readied ourselves to go. Now it was I who dallied, looking at the beautiful scene around. Despite being mid-morning there were only a few people about. It was all peace and calm in a wonderful setting and I had to drink it in. The beautiful small village harbour. 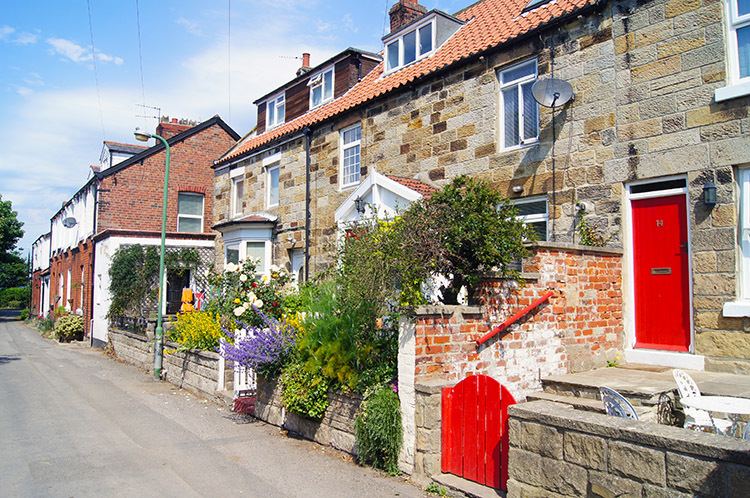 The immaculately presented whitewashed houses. The small boats leaning sideways while stranded in the harbour with the tide being out. It was the perfect place to start the walk. 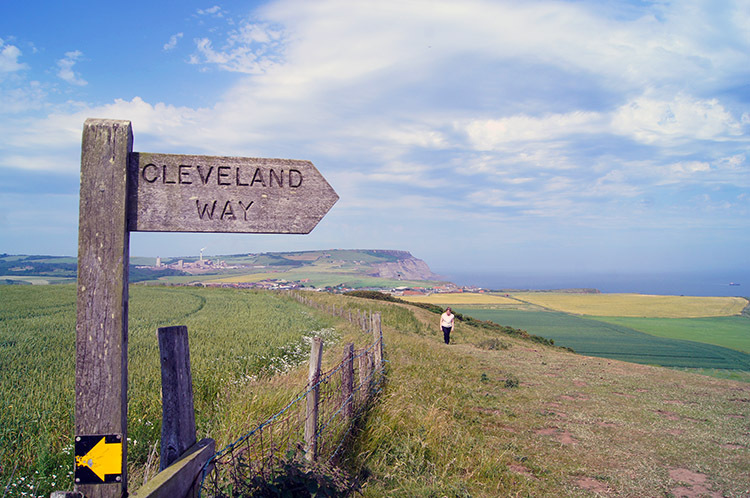 Any lethargy from the 90 minute drive to Staithes and the amble down to the harbour was soon shaken off by the steep climb up Church Street which led us on the Cleveland Way National Trail Footpath from the village. Up the street we went while admiring the house frontages and their accompanying handkerchief sized gardens which were on the far side of the road from the properties. Though the gardens were small most were very well presented and to be admired by us taking a brief pause. Well, that was our excuse. With the higher-most house of Church Street passed we turned a corner to level out and enjoy a leisurely walk east towards Old Nab. We came to a paddock with horses. Lil was drawn to them and they were drawn to Lil. We stopped for five minutes while they made friends. I did not mind Lil taking her time. The weather was perfect and there was no reason at all to rush. So I took my time too. At Old Nab we met another couple who were strolling in the opposite direction. They agreed it was just about perfect to be strolling along the North Yorkshire coast. While Lil and the couple continued to chat I admired the view to Brackenberry Wyke and Old Nab which led up the coastline in a north-west direction. 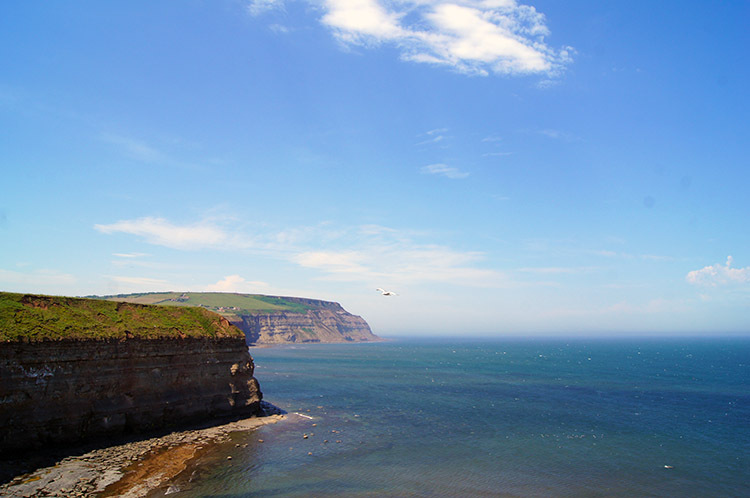 Then I turned to admire the view of Rosedale Cliffs stretching out to the south-east. Beyond Rosedale Cliffs was Kettle Ness. 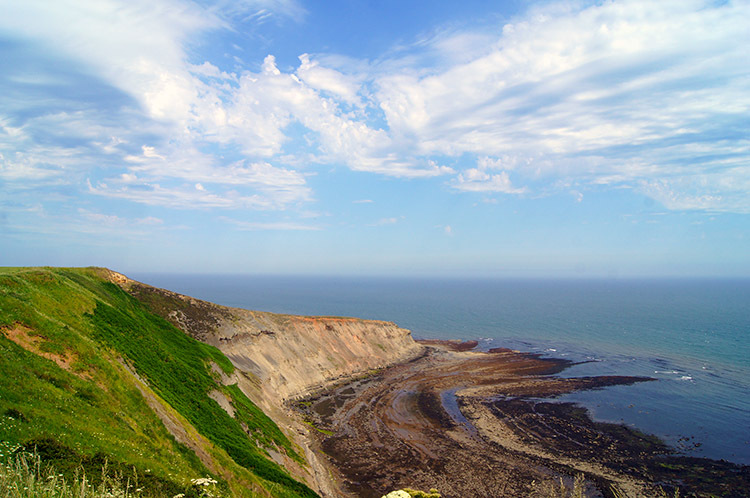 Between them Runswick Bay was hidden from view by the outcrop of Lingrow Cliffs. I knew it was there though. After the conversation with the couple ended Lil rejoined me and we walked past Thorndale Shaft to where we would leave the coastal path at Port Mulgrave. Before we turned inland I admired a few sea birds effortlessly gliding just above our heads on the thermals created by the cliffs. I never tire of watching the birds gracefully soaring with very little effort. It is a magical sight. With heads turned inland we walked along the straight line of Rosedale Lane which is practically the sum of Port Mulgrave. At the end of Rosedale Lane we reached Hinderwell. 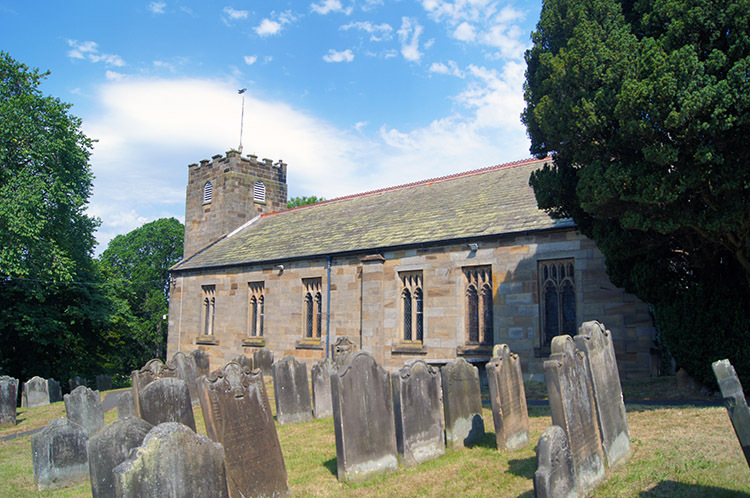 The village church came into view at the end of Rosedale Lane from where we turned left to follow the road skirting around the churchyard. This led us to the A174 coast road which is often busy. It was unusually quite and we crossed with ease. After crossing the A174 we followed Porret Lane in order to leave the village. A street of cottages, most pristinely kept, it was a delight to walk along. Porret Lane continued beyond the pretty houses and led us around on a half circle to reach a direct-line lane leading south-west towards a small paddock field which we crossed on a descent towards a dense area of trees. 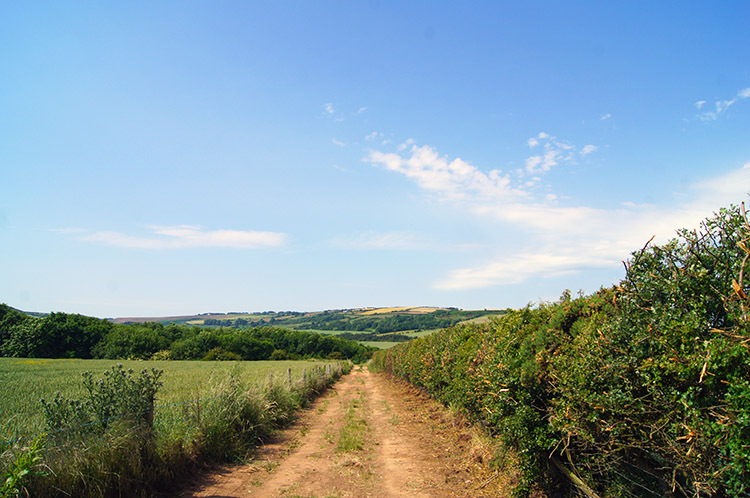 After walking through villages and on coast paths the atmosphere of the walk was to completely change. Woodland was ahead. The sun continued to beat down as it had all morning. Now around midday it was getting to its maximum height and the though of taking cover in woodland was not a bad thing. And as we walked down through the paddock field the prettiness of the surroundings suggested it was going to be good fun in the woods. We were not to be disappointed. 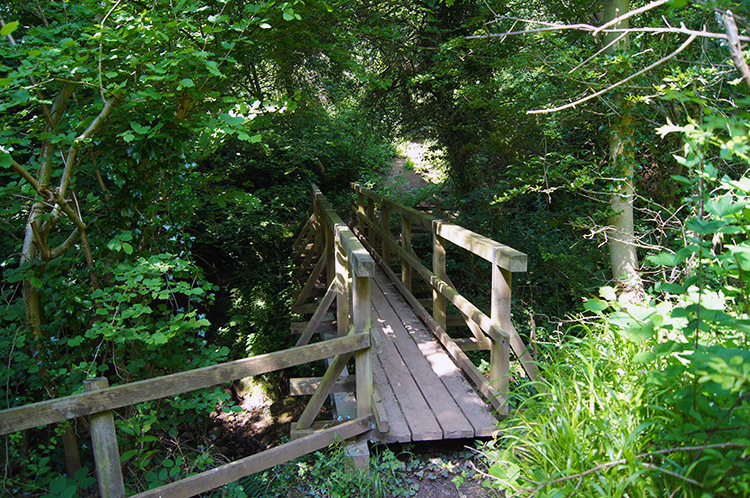 A small wooded footbridge over Dales Beck led us to the woodland path and then we simply followed the meandering course it took through the woods on a course roughly parallel but not exactly in line with the course of the beck. 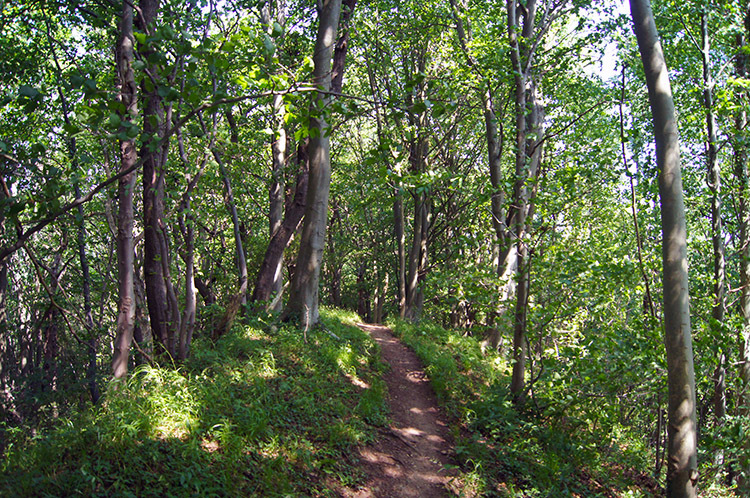 The path through Oakridge Wood was a very good one, well maintained and easy to follow. No doubt this is a popular walking area and true enough we met quite a few others walking in the woods. All were enjoying the surroundings. A little way through the woods we came to a sign which said "Oakridge Nature Reserve. No Hunting". So the wood doubles up as a local Nature Reserve. Perfect. We came to a clearing in the woods leading the way from the dense cover and back into full sunlight. I was tempted to go back inside the dappled shade but Lil pressed me not to. "Onwards, she said" anticipating an ice cream when back in Staithes. The ice cream would have to wait a little longer though as we continued along the clearing and came to some wooden sculptures beside the path. 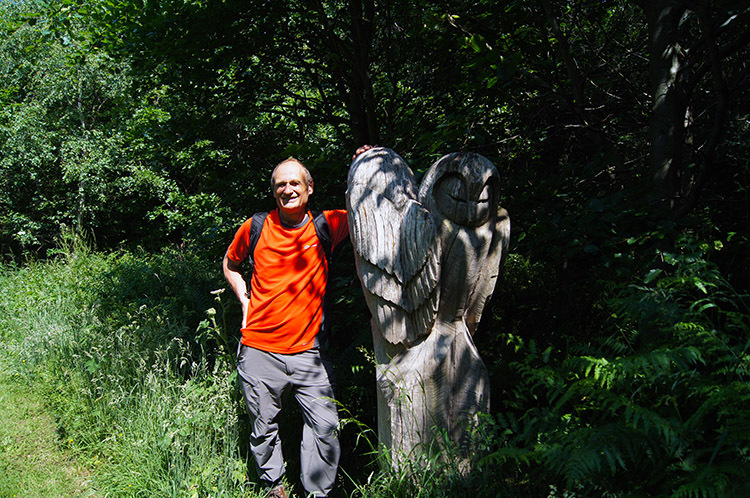 One of the sculptures was of a brace of Owls. I joined them to form the Parliament of Oakridge Nature Reserve. We came to an information board in the nature reserve which said "Oakridge Nature Reserve. So named from the abundance of native English Oaks to be found herein. To these have been added many of the sixty five different Oak species that can now be found growing on our land". I never knew there were so many types of Oak. Soon after walking past the sculptures and the information board we reached a signpost at the end of the clearing. One way indicated was straight on to Staithes in a north-west direction. That was no our way though, crossing a bridge by the signpost and over Dales Beck led us on our path, due north. 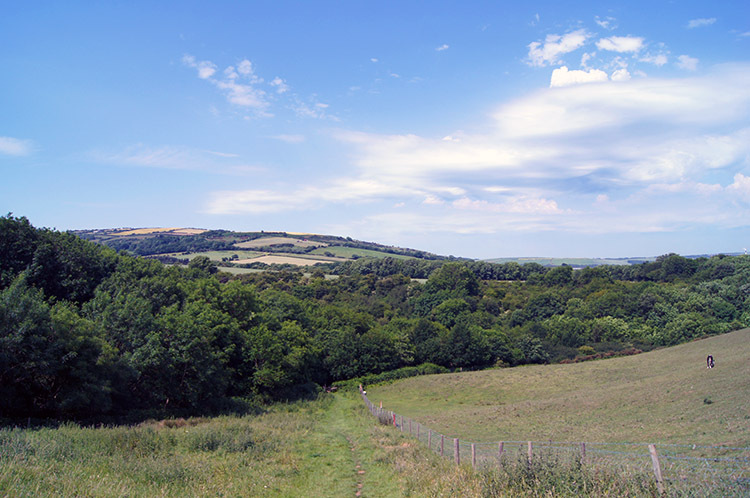 The path north took us on a short steep climb over a hill and past Seaton Hall to the crossing of the A174 once more. Again it was uncannily quiet for traffic as we crossed but we were not complaining. A convenience store was on the far side of the road and thus Lil got her ice cream. Much deserved too. 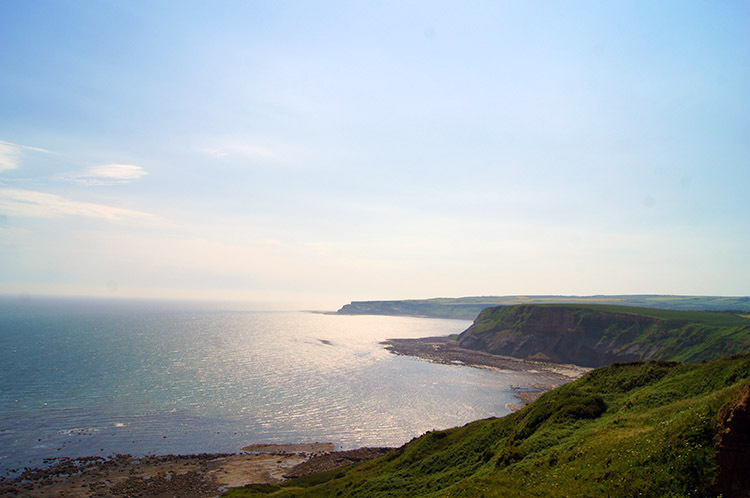 It had not been a taxing walk but it had been hot and sticky once we had left the refreshing warm breeze of the coast at Port Mulgrave. 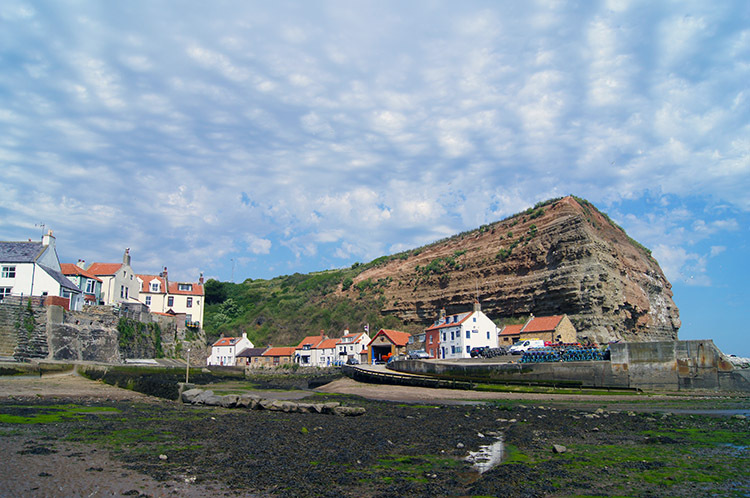 o complete the walk we continued from where we had parked the car back into Staithes and enjoyed a cafe lunch while watching the quiet goings on in and around the harbour. No one was in a hurry.